Ireland's 1798 Rebellion occurred a decade or so after the American Revolution and the French Revolution. There is a common thread. Faith in Supreme Being, with that faith manifested in accordance with individual's belief. Basic human rights were granted by the Creator, and not by kings and lords. This doesn't seem such a radical position today, but it was certainly radical in the 18th Century. These concepts are incorporated in America's Declaration of Independence, and the Constitution. It should be obvious that they are entirely consistent with the basic principles of freemasons. And indeed, there were freemasons - like George Washington, Benjamin Franklin, and James Monroe - actively involved in the creation of the United States. The English were scared to death that the same movement would take hold in Ireland. And indeed it did. 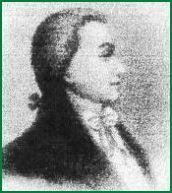 In 1791, a group of men met in Belfast and formed the Society of United Irishmen. At the time, Ireland was a colony of England, governed much the way as the 13 American colonies. The Irish sovereign was the king of England. Ireland had its own parliament, but it was dominated by Irish Protestant landlords. 1. English control over Ireland was so great that it required a unified effort of all Irish to balance it. 2. The only way that could be done is with a complete and radical reform of the Irish parliament. 3. No such reform would be just without the participation of Irishmen of every religious persuasion. The United Irishmen simply wanted a freer society, governed in a way that represented all people, with less dictatorial rule and more civil liberties. Ireland at the time was about 80% or so Catholic, and Catholics were totally excluded from participation in the political process at the time. There were many organizations of Irish Catholics pushing for the same thing. But with the United Irishmen, Ireland had, for perhaps the first time, Irish Protestants and Irish Catholics seeking the same end. Many, but certainly not all, of the United Irishmen were masons. And, as in the case of the American Revolution, it should be clear why. What the United Irishmen wanted was entirely consistent with masonry. As a reminder, this was a time when masons opened up its membership to people who were not masons by trade. Men who demonstrated good character and who accepted the principles of masonry could become masons. In the parlance of the times, these men were 'gentlemen'. The masons of Ireland then were almost entirely Protestant. There were two reasons for this. One is that there were very few Irish Catholics at the time that could be called 'gentlemen'. This is not because they lacked character. It was because there were very few Catholics who had any form of social standing or education or occupation which could give them the status of being a 'gentleman'. Most Irish Catholics were laborers on Protestant owned farms, or were tenant farmers of a few acres of land. The other reason was the attitude of the Catholic Church towards masons. Masons never prohibited Catholics from joining. But the Catholic Church prohibited Catholics from becoming masons, under penalty of excommunication. The British government banned the United Irishmen, and it thus became a secret society. Members swore an oath of allegiance and of secrecy. The British then made it a crime, punishable by death, to administer any unlawful oath.